Missouri’s health insurance marketplace will be run by the federal government. It’s unclear where the federal government is currently at in the process of creating the marketplace for Missouri, but regardless of what happens, that online marketplace will be open for enrollment by October. In November, Missouri voters passed Proposition E, effectively enacting a law that limits the state government’s ability to help the federal government with creating the marketplace. To see the entire history of Missouri’s health insurance marketplace’s complicated relationship with the federal government, read this roundup from our friends at KCUR. Who’s eligible to buy insurance in the marketplace? · You live in the U.S.
Small businesses (fewer than 100 employees) can also purchase insurance through the exchange. If you're already insured, you can keep your plan. The Congressional Budget Office expects the health exchange to provide insurance for 26 millions Americans by 2022. Can people get help with premium costs? Yes! If you make between one or four times the federal poverty level, you’ll be eligible for tax credits on a sliding fee scale. The less you make, the less you’ll have to pay for a premium. If your family’s income is at the federal poverty level ($23,500 for a family of four), you’ll only have to pay 2 percent of your total income for an insurance premium. 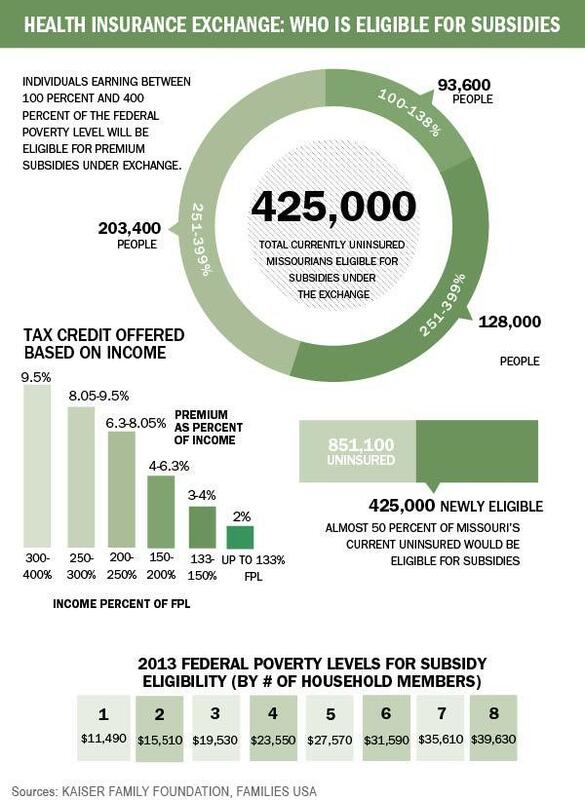 Check out our nifty graphic about how many Missourians could be eligible for this subsidy, and more details about different levels of the tax credit. In Missouri, about 851,000 people are uninsured. About half of that group will be eligible for these tax credits through the marketplace. What does an application to the marketplace looks like? There’s no final draft yet. The Center for Medicaid and Medicare Services recently made public an early draft of the general application for anyone looking to get financial support to with their premiums. As The Associated Press reports, the draft of the paper application for a family of three is about 15 pages. An online version has 21 steps. The Department of Health and Human Services estimates it will receive more than 4.3 million applications for financial assistance in 2014, with online applications accounting for about 80 percent of them. What does an online health insurance marketplace looks like? We don’t know how Missouri’s marketplace would look yet, but some other states that chose to run their own exchange already have websites up and running. It might be helpful to visit these websites to have an idea of what Missouri’s marketplace might look like. Generally, these websites look pretty consumer-friendly. Covered California, for example, has a cost estimate calculator. It also has tables of benefits summary for exemplary health plans. The federal government requires state health marketplaces to have four levels of coverage: bronze, silver, gold and premium. Each level will also have different plans for people to choose from, most likely from several different private insurers, as well. Who can help me with the marketplace? The Affordable Care Act requires every state’s health insurance marketplace to have navigators – those who are trained to help and educate people as they make their way through the exchange and get to the correct insurance plan. 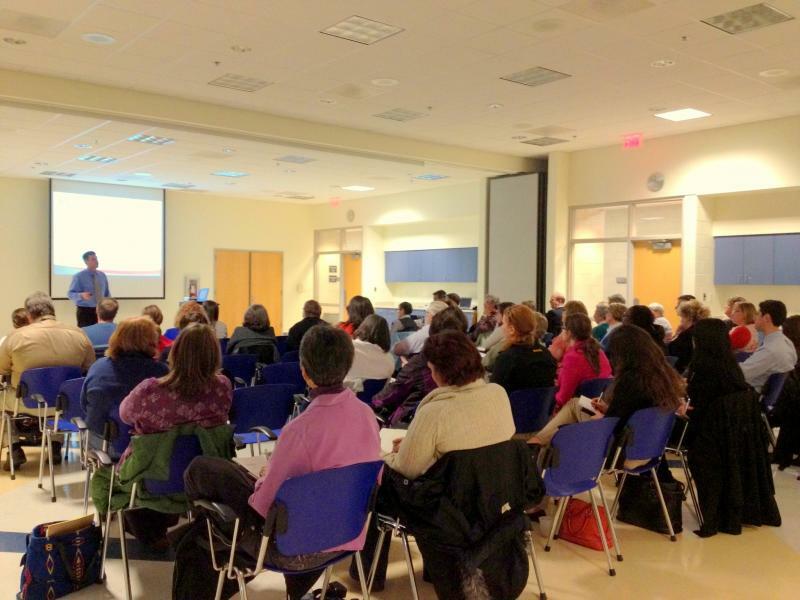 Nonprofits, trade associations and unions are expected to be potential navigators, among others. The federal government is running Missouri’s exchange, so they’re also responsible to establish a program that would give grant money to possible navigators. 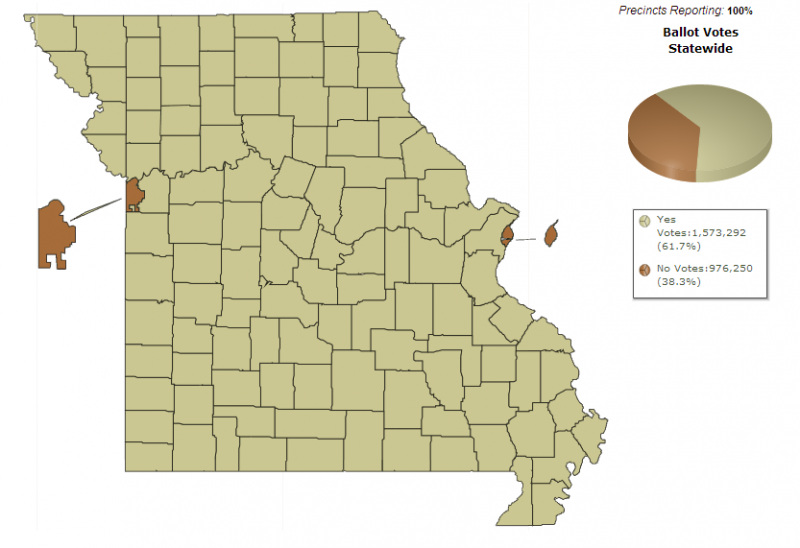 It's not clear when the feds are going to start giving grants yet in Missouri. To illustrate the importance of navigators: According to The Washington Post, California plans to hire 21,000 “in-person assistors” that would help more than 700,000 people get insurance coverage under the health insurance marketplace. What can we do to get ready? 1. Learn about different types of health insurance. Through the Marketplace, you’ll be able to choose a health plan that gives you the right balance of costs and coverage. If you’re a small business owner, click here for the Department of Health and Human Services's checklist of what you can do to get ready for enrollment in October.